The world-building game will jump to the printed page next year. Between its bloodless world, constructive goals, and Lego tie-ins, Minecraft is arguably one of the most kid-friendly games out there right now. Of course, no child should spend all of his or her time in front of a computer. To that end, developer Mojang may have figured out a way to keep the young'uns engaged in its world of blocky miners even when they're away from the keyboard. Egmont Publishing, a specialty, UK-based children's publisher, will release printed products based on the indie darling next year. Egmont now possesses all book and magazine rights for the Minecraft IP, although it has remained tight-lipped on its plans for them. "We are working closely with Mojang and with Minecraft enthusiasts to create a range of products that will deliver extra depth and breadth of content to engage and inspire fans and to enhance the experience of playing Minecraft," says an Egmont spokeswoman. 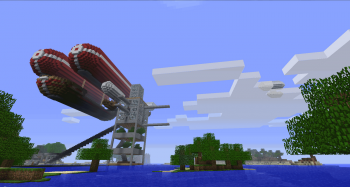 "Minecraft excites and inspires millions of kids around the world and their appetite for content is obvious from the huge success of the online tutorials posted by passionate fans." Based on her comments and the company's general raison d'Ãªtre, Egmont's Minecraft publications will likely skew towards a younger fanbase. This is hardly Egmont's first foray into the world of gaming, as it recently acquired similar rights from Rovio to produce Angry Birds books. Nor is it likely to be Egmont's last such acquisition: According to David Riley, one of the company's directors, "The deal is a great fit with Egmont and sits brilliantly amidst our growing portfolio of viral video, social media, virtual world, mobile and online gaming entertainment properties." Children's books based on videogames are nothing new, but whereas the last generation grew up with picture and chapter books based on Mario and Sonic, this generation may learn to love reading with the blocky protagonists of Minecraft and the cast of Angry Birds. In the grand scheme of things, that's probably not any less strange.